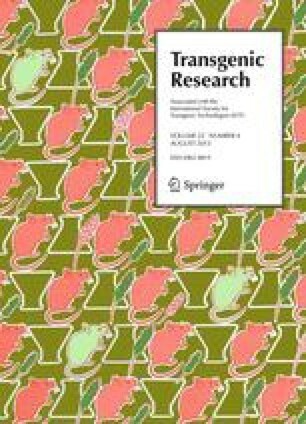 Transgenic technologies provide a promising means by which desirable traits can be introduced into cultured fish species within a single generation thus accelerating the production of genetically superior broodstock for aquaculture. However, before such fish are allowed to be marketed as food they must receive government regulatory approval. Two pivotal regulatory requirements are: (1) complete characterization of the genomically integrated transgene and, (2) demonstration that the transgene remains stable over multiple generations. We have generated a stable line of growth hormone (GH) transgenic Atlantic salmon (Salmo salar) using an “all fish” gene construct (opAFP-GHc2) containing a growth hormone cDNA from chinook salmon whose expression is regulated by the 5′ promoter and 3′ termination regions derived from an ocean pout antifreeze protein (AFP) gene. In this study we show that a reorganized form of the opAFP-GHc2 construct (termed EO-1α) integrated as a single functional copy into a 35 bp repeat region of the genomic DNA. PCR based mapping revealed that the linear sequence of the EO-1α integrant was organized as follows: base pairs 1580–2193 of the ocean pout promoter region followed by the intact chinook salmon GH cDNA, the complete ocean pout antifreeze 3′ region, and the first 1678 bp of the ocean pout antifreeze 5′ region. Sequence analysis of the EO-1α integrant and genomic flanking regions in F2 and F4 generation salmon revealed that they were identical. In addition, apart from the disruption at the integration sites, the consensus sequences of the integrant in these two generations of salmon were identical to the sequence of the opAFP-GHc2 construct. These results indicate that the EO-1α transgene codes for the chinook salmon GH, and that the transgene and the integration site have remained stable over multiple generations. An erratum to this article is available at http://dx.doi.org/10.1007/s11248-006-9059-6.